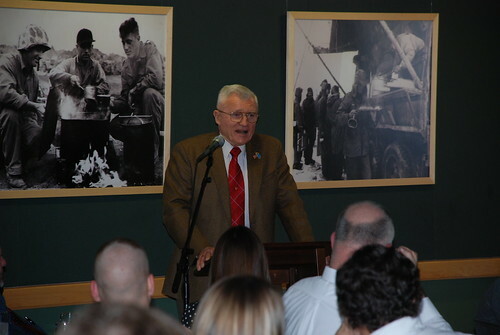 Last week, Col. Wesley Fox spoke about his experience as a company commander during Operation Dewey Canyon. I haven't had a chance to unpack his talk, you know that is what I do here, its how I learn and retain what I've been told. I still don't have time to unpack it so I'll revisit later in the week. I think it has some parallels to Afghanistan - - not in that Afghanistan is going to be Obama's Vietnam. I don't think that at all. In short, Dewey Canyon was an operation that took the fight from the Fire Support Bases to North Vietnamese along the Ho Chi Minh trail. It was a surprise to the NVA because they didn't expect US forces to cross into Laos, a neutral country. The results of Operation Dewey Canyon impeded the flow of weapons and personnel to the south. It also prevented the NVA from executing attacks on the cities in the Northern sector of I Corps of South Vietnam in 1969, probably saving the lives of hundreds if not thousands of civilians, NVA, SVA and US Marines. The Battle of Hue City is another big touch stone battle for the Marines in Vietnam. February 20th, General Ron Christmas (ret) will be speaking on his experiences as a company commander in that battle. I'm really excited about that. One of my fellow docents and blog friends, Miss Jess, heard General Christmas speak at her husband's Marine Corps Ball a couple years ago. She said he was fabulous - - and she of course took notes. General Christmas will be doing his presentation in the Vietnam gallery, which I think will add to his talk. You can purchase tickets for this event ($35 per person) by contacting dodson@marineheritage.org or by calling 703-649-2350. Now, I'm also very excited about this next event. Bing West is slated to speak on Thursday March 5th in the "Evening with a Distinguished Speaker" series. The Distinguished Speaker events are more expensive and the ticket price was not included on the announcement I received. You better believe I have this on my calendar.